Growing up with parents who preferred nature over amusement parks meant that I spent my childhood summers on road trips to National Parks in the Western United States. We visited parks like Yosemite, Olympic, Redwood, Mt. Rainier, Glacier, Grand Teton and Yellowstone. These childhood experiences instilled in me a deep love of nature and wildlife that’s followed me into adulthood. I rarely flip past a nature show on television and my heart still skips a beat when I see a hawk or eagle flying, which is quite often here in Colorado. To say I was excited about this outing is an understatement! 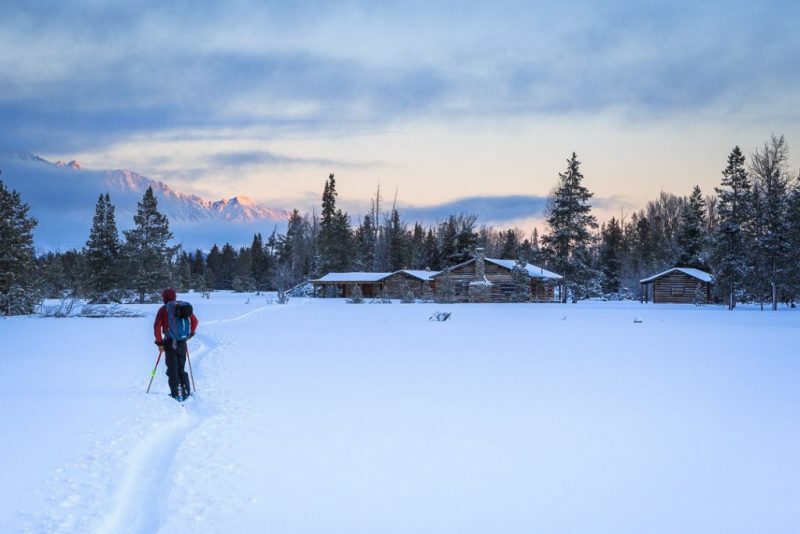 When I was offered the chance to do a wildlife tour with Jackson Hole Eco Tour Wildlife Adventures this winter while visiting Jackson, Wyoming, I jumped at the opportunity. We were booked on a full-day outing, 8:30 a.m. until about 4:30 p.m. We boarded JH Eco Tours fancy schmancy “wildlife safari” vehicle and headed out. The bus includes big windows, comfy seats with lots of places to store stuff and removable roof panels like the ones you see on African Safaris. 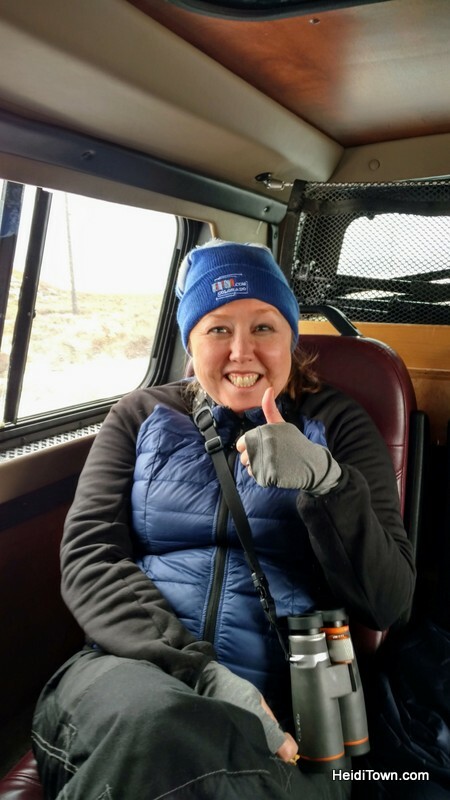 Our driver and guide was Chelse Grohman, who was visibly excited about the day ahead and never lost her enthusiasm. Ryan and I were accompanied by three gals from the East Coast who, thankfully, were just as eager to see wildlife as I was — and boy, oh boy, did we see wildlife. 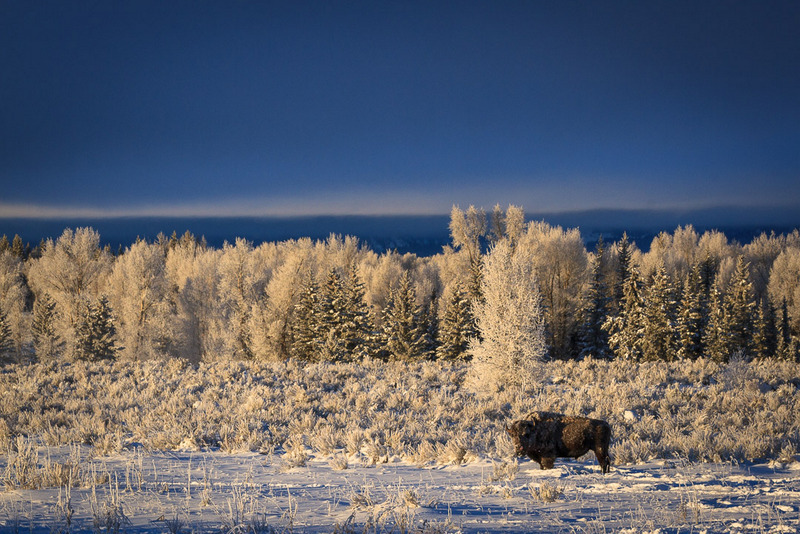 We’d spotted coyotes, elk, bison, a variety of birds and bighorn sheep all before 10 a.m. 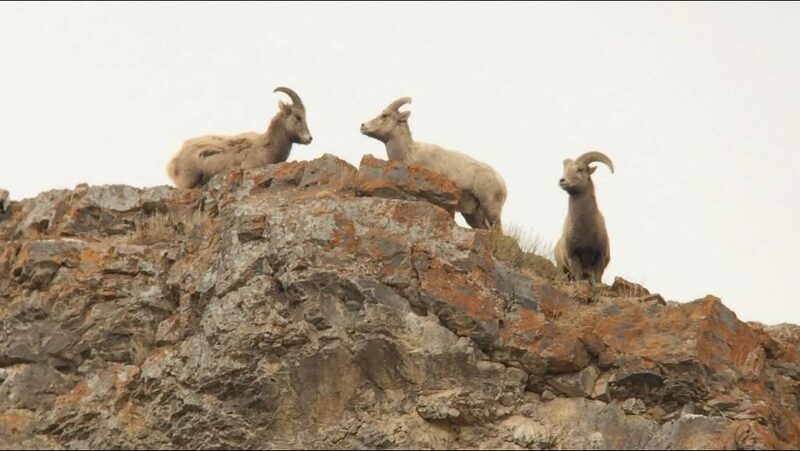 The highlight of the morning was a group of young male bighorn sheep playing “Who Hits Harder” at the top of a steep cliff. 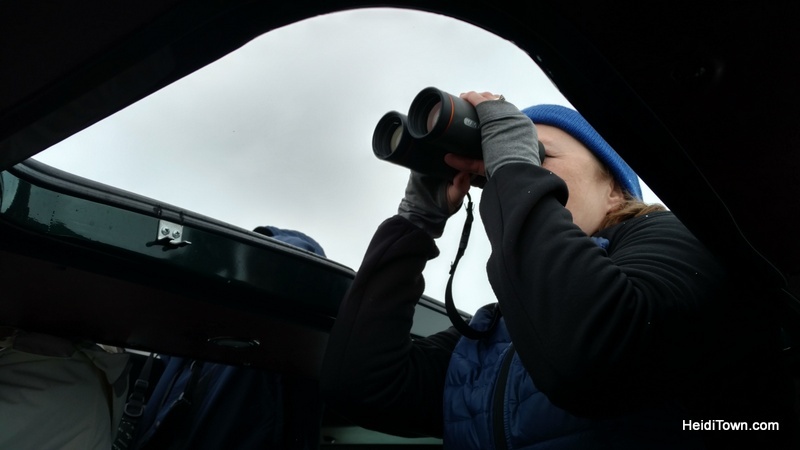 We could easily see them through the spotting scopes provided by JH Eco Tours. Other than elk, our first wildlife sighting of the day, as we drove onto the National Elk Refuge, were a pair of coyotes on a flat out run. While coyotes are frequently seen on these outings, wolves are a bit rarer. Wolves were my favorite animal as a little girl and years ago, I thought that I’d spotted one in Yellowstone before the reintroduction. As it turns out, my “wolf” was actually a huge and healthy coyote. I was hoping to see a wolf on our JH Eco Tour, alas, we did not, but we saw a lot that made up for it. 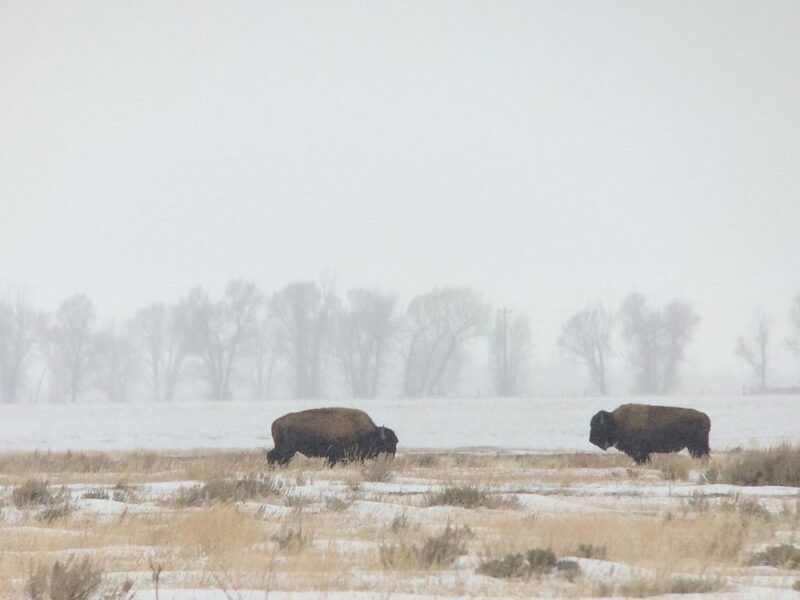 Outside of Kelly, Wyoming, a small town that’s technically located inside of Grand Teton National Park, we witnessed a scene right out of an Attenborough nature special. 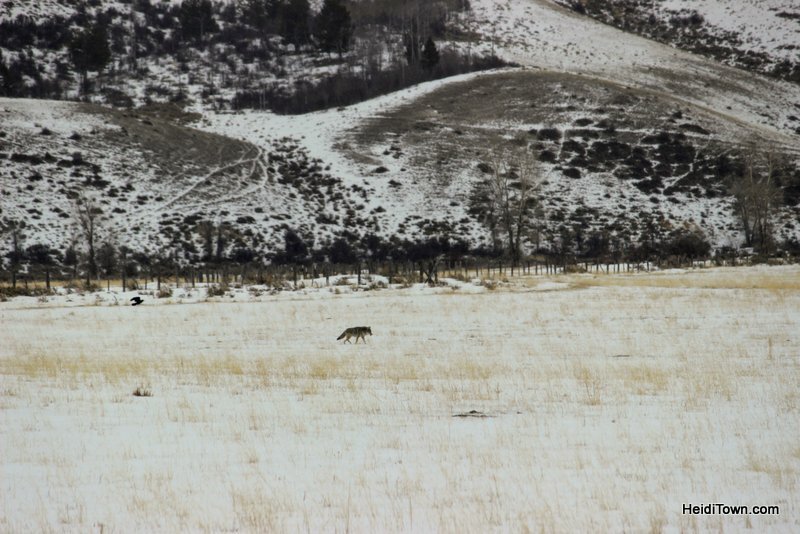 Coyote on the hunt outside of Kelly, Wyoming. We could see her really well with binoculars – better than through my camera lens. We stopped to watch a coyote hunting in a big field. Chelse advised us to stay in the car so as not to spook the coyote so we used binoculars instead of scopes. As we watched, the coyote gingerly worked her way, stiff-legged across the snowy field trying not to break the crusty snow. Suddenly, she pounced and within a split-second, there was a squirming rodent dangling from her mouth. It wriggled free, but the coyote caught in midair and gulped it down in what appeared to be one swallow. We were all elated to have witnessed this successful hunt. Taking this tour isn’t like touring a zoo; here you get to see animals in their natural environment living their everyday lives. This is what makes the tour and this area so very special. After lunch at Dornans, in Grand Teton National Park, we spent the afternoon snowshoeing. In the summer, JH Eco Tours lunch, included in the price of the tour, involves an outdoor picnic. With a degree in Wildlife & Fisheries Management, plus, a lot of additional life experience in the field, Chelse has an incredible understanding of the natural world and her tracking skills were a fun addition to our snowshoe excursion. In addition to tracks, she pointed out bear fur caught on trees, places where animals had bedded down and much more. 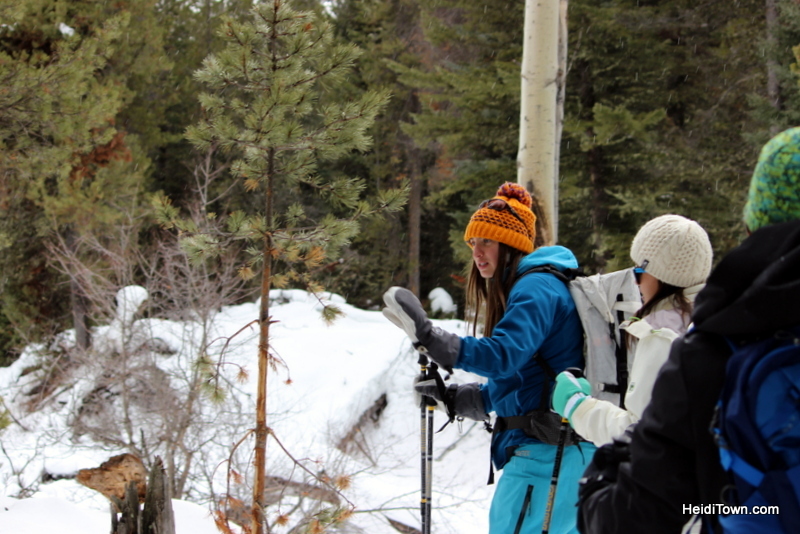 Despite only seeing a few chickadees on our snowshoe trek, “seeing” the forest through Chelse’s eyes brought it alive. Chelse points out animal fur stuck to a tree. 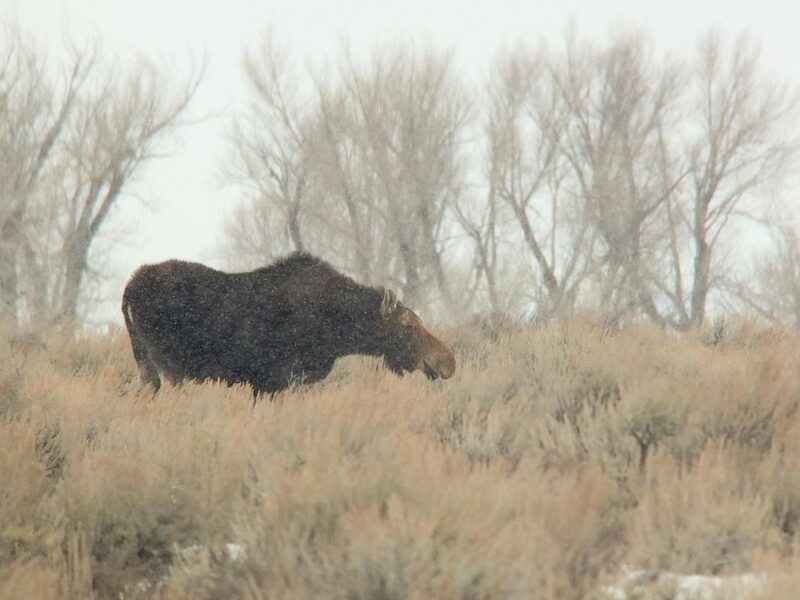 By the end of the day, we’d spotted tons of animals including moose and bison and even goldfish in Kelly Warm Springs. At some point, someone dumped them there and they’ve not only survived but thrived. 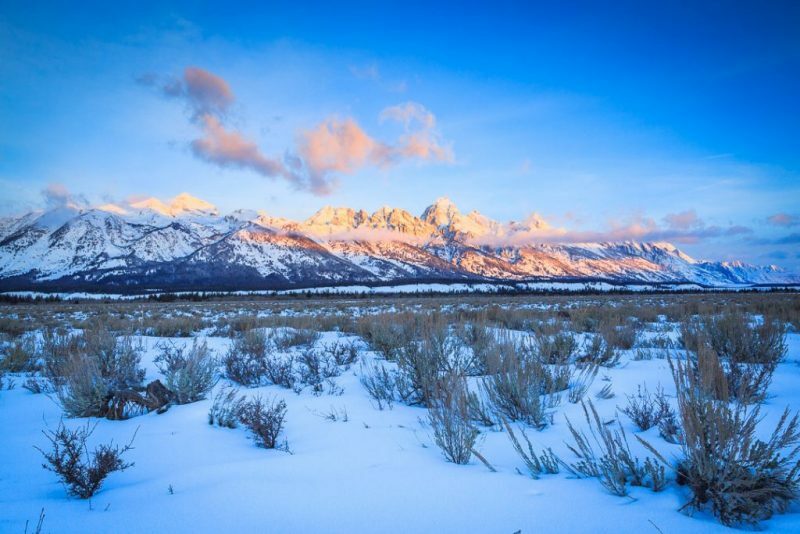 JH Eco Tour Adventures offer a variety of tours into Grand Teton and Yellowstone. I love that they are practicing what they preach and offering a tour that’s truly eco-friendly including reusable water bottles (that guests get to keep) and offering snacks that are local and in eco-friendly wrappers. It’s the little things that add up and really do matter. 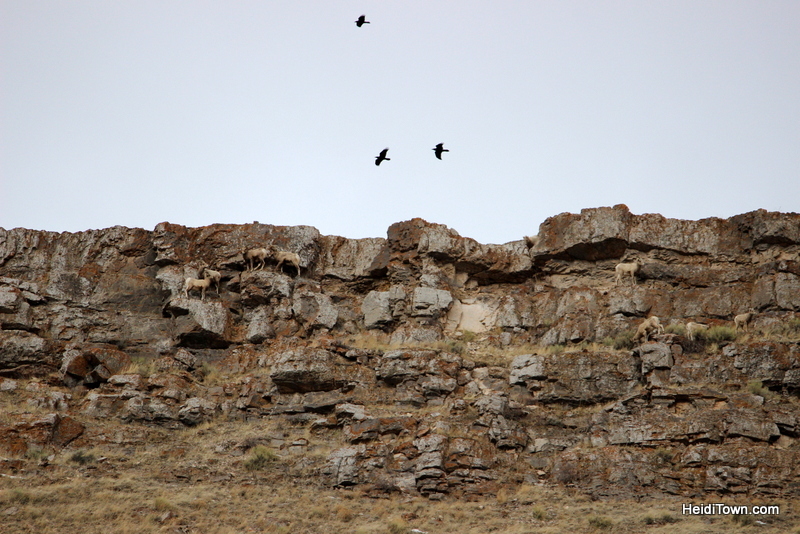 Can you spot all the Bighorn Sheep in this photo? 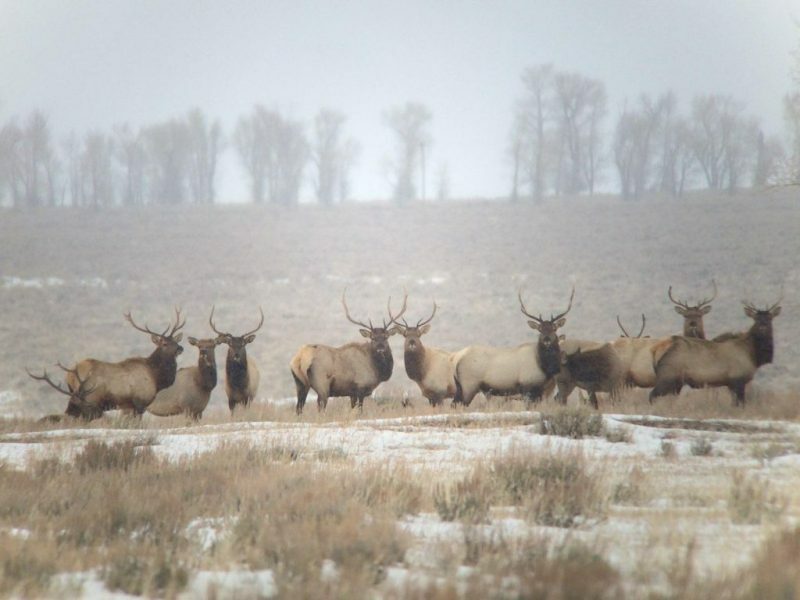 In the National Elk Refuge outside of Jackson, Wyoming. Lastly, this company employs guides who respect nature and that means a lot to me. As I wrote above, this is not a zoo tour. On these outings, we are visiting animals in their world and the utmost respect should be paid to both the wildlife and the land. I highly recommend putting a tour with JH Eco Tour Adventures on your Wyoming bucket list. 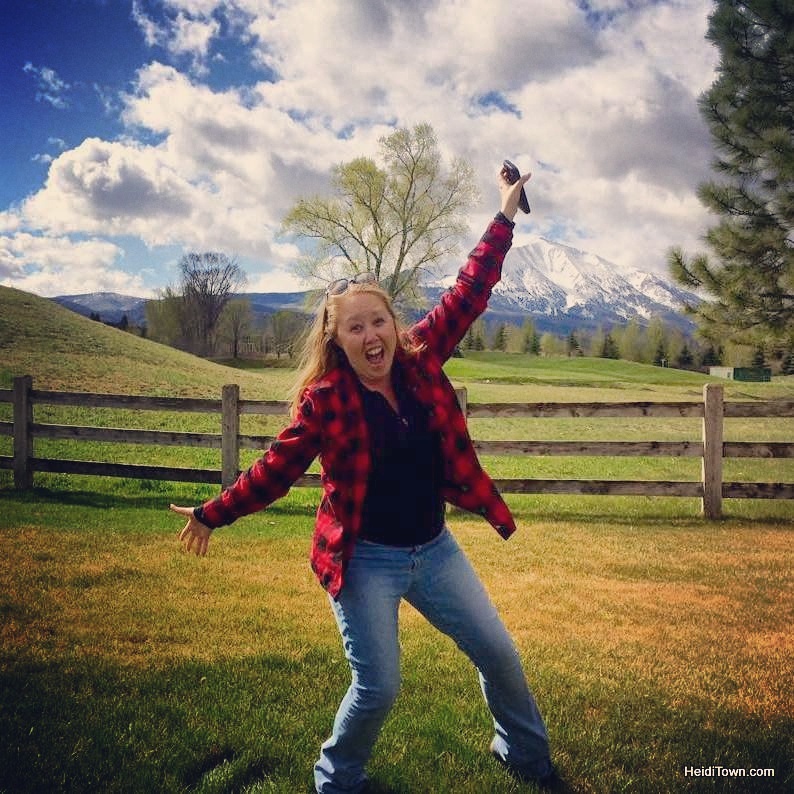 A special thank you to Jackson Hole Chamber of Commerce for hosting me in Wyoming and to Jackson Hole Eco Tour Adventures for providing us with this experience. Also, thank you to Josh Metten for the use of his photography in this post. You can follow him on Instagram and Facebook. Haha! I think that may be a way this new template tries to decrease spam comments. Don’t be like a bot! I knew you’d love the moose. So many moose in that area. It’s pretty much your homeland.